This is an adult male spider as evidenced by the enlarged pedipals. Observed in a moribund state on a block wall with many active funnel webs. Eldoret, Kenya, January 2012. Spiders belonging to the family Agelenidae build smooth, trampoline webs. At one corner or near the center the web narrows to form a tunnel into a crevice where the spider normally remain. The spider emerges, often with amazing speed, when an insect falls upon the web. Above the web are often build a series of web strands that tend to knock passing flying insects. Female funnel web spiders generally remain secure within their web funnels. But males must abandon their webs and search for receptive females. Unreceptive females may well deliver a fatal bite. 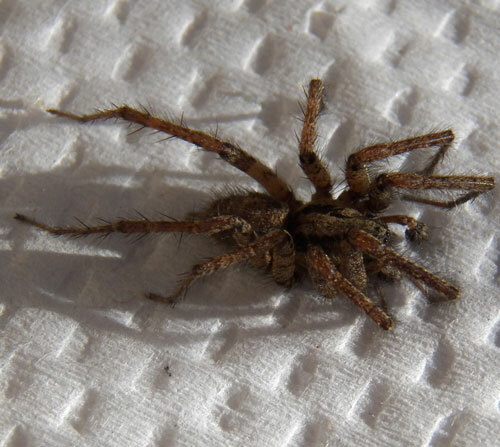 Also, spiders being very soft-bodied are vulnerable to insectivores or all kinds. Thus the male's imperative comes with considerable risks. In the close up the orange arrow points to eight small eyes in two rows. 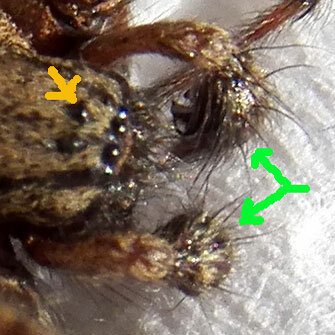 The green arrow indicates the two enlarged pedipals characteristic of male spiders.